With immense market knowledge, we have been able to provide optimum quality Silicone Oil Seal. Silicone is a semi-organic elastomer with outstanding resistance to extremes of temperature with corresponding resistance to compression set and retention of flexibility. Silicone elastomers also have excellent weathering, ozone and aging properties. This Silicone Oil Seal is resistant to high and low temperature, is corrosion-resistant and possesses anti-oxidation qualities. The Silicone Oil Seal is of optimum quality and highly popular among the clients across the country. We are one of the leading suppliers of special Silicone Oil Seal. Our range of products includes a resilient variety of rubber seals, silicone seals etc. We are offering Silicone Oil Seal. - Approx. price Rs. 10 to 100 per pc. 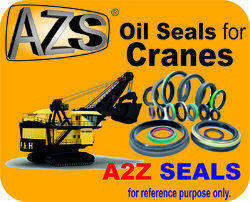 Widely demanded to provide optimum sealing of oil in an engine, this Silicone Oil Seal is made of high-grade material.